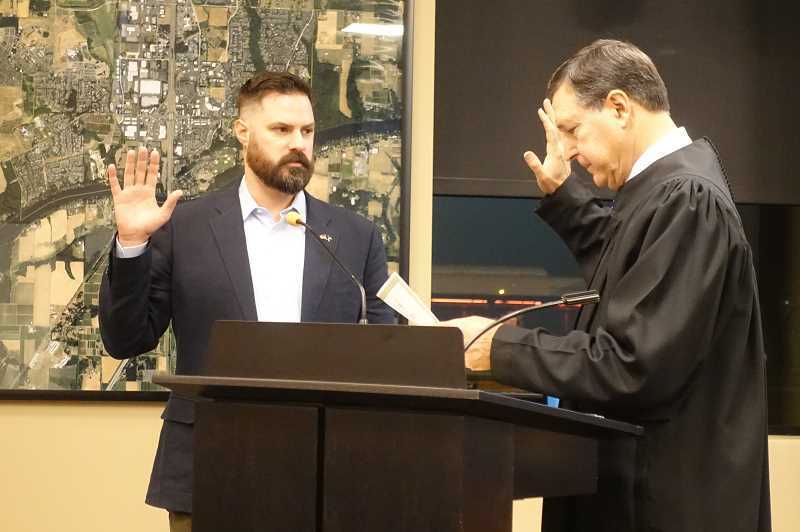 Ben West had a busy first evening as a new member of the Wilsonville City Council Monday, Jan. 7. Along with delivering a speech to his constituents and being sworn in, West was defiant at times during the work session and council meeting and conciliatory at others. And, even though he was critical of the council's performance during his campaign and council discourse was a bit more tense than when former councilor Scott Starr was on board, he showed a willingness to compromise and work amicably with his fellow councilors and to inquire with City staff about the nuances of policy. During Monday's work session, West appeared steadfast in his opposition to sending a letter of support to Clackamas County in favor of adding a $30 per year car registration fee to raise money for road maintenance and improvements. A staff report noted that while Washington County and Multnomah County receive millions of dollars in funding from taxes such as a gas tax, Clackamas County had no such source of localized funding. On top of that, Clackamas County is said to have a shortfall of $17 million per year to maintain its roads. Wilsonville Mayor Tim Knapp, newly appointed Council President Kristin Akervall and re-elected Councilor Charlotte Lehan all voiced strong support of the letter from the get-go. "Road maintenance, if neglected, becomes much more expensive in the future," Akervall said. "You either pay for it now or later at a higher rate. I think it's wise to take care of the roads that we have." Though he acknowledged that Clackamas County's roads are in serious need of improvements, West was more skeptical of the idea. He worried that Clackamas County might spend the money unwisely, brought up community members who might struggle to afford the fee and initially supported putting the idea up for a ballot measure. "There's a history where government always needs a new pot of money and they can find a really good rationale to use it," West said. "At a certain point citizens start to feel nickeled and dimed." But in the end, after City Manager Bryan Cosgrove suggested adding a stipulation to the letter stating that the added revenue should go directly to road maintenance rather than be sucked up by administrative costs, West supported the letter. Things got a bit tense when the council discussed the French Prairie Bridge, a proposed bike/pedestrian crossing over the Willamette River. While West agreed with the council's preference for cable stayed and suspension bridge types to be further studied (which was the point of the discussion), he questioned the City's planning for the potential bike, pedestrian and emergency vehicle bridge and wanted to know projected costs. "We're known for bridges in this region and that's great but just being cautious with my neighbors' money, I would really caution us to (move forward with) something that's not even funded yet, spending a lot of money doing a lot of research and planning when we have no funding for this future project," he said. Cosgrove said the analysis is funded by a Metro grant and system development charges and that the City can both improve the Boone Bridge and continue to plan the French Prairie Bridge project. Knapp said the analysis is crucial to determining project costs. "You cannot answer the question of how to fund it until you do this work," Knapp said. "We're not making a decision to go forward with it. We're establishing the parameters that would be required if we were to decide ultimately to go forward." In his first address to the citizens of Wilsonville after being sworn in, West said he would prioritize policy that brings about improvements to the Boone Bridge, mitigate traffic issues and bolster youth sports facilities and that he is committed to spending taxpayer money wisely and avoiding the imposition of unnecessary taxes. "We need to put to rest antiquated government approaches. We need to make sure property taxes aren't necessarily hiked to pay for crony contracts and inefficient government," West said. "It's easy for us to feel like we live in the most turbulent of times but nights like this remind me that our communities are the areas we can make the biggest difference, where national politics and trivial partisanship start to dissolve. Instead of Democrats or Republicans we see each other as neighbors." West also voted against the reappointment of Planning Commissioner Simon Springall, who he sparred with on social media during the campaign, voted in favor of Akervall's appointment as council president and abstained from a vote on a zoning issue because it was first addressed at a previous meeting. Finally, he asked City staff questions about new Federal Communications Commision policies that will bring about the proliferation of small wireless facilities in Wilsonville and a damaged outfall in Charbonneau. "I'm excited to serve my neighbors and ensure that we continue to grow as a community, that we minimize inevitable growing pains while pushing our community to be the greatest it can be and to remember to diligently focus on what is best for the working people in Wilsonville," West said in his speech.